SOUTHAMPTON, UNITED KINGDOM--(Marketwired - Oct 9, 2013) - Weddings, when done well, celebrate a couple with seamless beauty, personalisation and service. And while pulling together the many pieces of a big event may have once seemed daunting, couples now have an easy solution: Meon Valley, A Marriott Hotel & Country Club. Offering an all-inclusive wedding package during 2014, this romantic property is handling every detail to make each wedding a memorable affair. Priced from £3,000, the package capitalises on one of the most scenic wedding venues in Southampton and includes a range of features, such as the use of a golf buggy so the happy couple can snap photographs throughout the property. With 225 acres of options ranging from an ancient oak forest to undulating Hampshire countryside, the photographic opportunities are virtually endless. Couples can capture romantic images against a forested backdrop, for example, and utilise the rolling greens for family photographs. Given the diversity of choice, it's never been easier to customize the photography so that it reflects the personalities of the couple and their families. 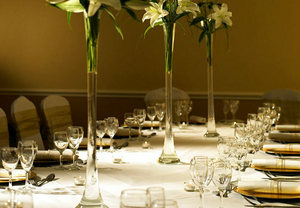 The package also includes the use of one of the hotel's wedding suites, a three-course wedding breakfast for 40 people, two glasses of wine, a glass of sparkling wine for the toast and an evening buffet for 80 people. From there, the new Mr and Mrs can retreat to their complimentary deluxe junior suite, and enjoy a complimentary breakfast the following day. Meon Valley in Southampton not only simplifies the planning process for the wedding couple, it also appeals to the couple's guests. Its 18-hole championship course stands out among Hampshire golf courses with tree-lined fairways and natural water hazards caused by its forest location. This alone might be enough to entice half the guests to come out for a long weekend. For the other half, there's The Retreat at Meon Valley, a full-service spa featuring scrubs, massages, manicures/pedicures and fitness classes. Everyone, meanwhile, will appreciate these Southampton hotel rooms, which combine gracious country touches like down mattress toppers and coffee/tea service with up-to-date modern amenities, including laptop-sized safes, flat-screen televisions and satellite channels. Couples interested in learning more about the all-inclusive wedding package at this civil-ceremony wedding venue should contact Stephanie Perry, Meon Valley's dedicated wedding coordinator, at 44-1329-836-860 or stephanie.perry@marriotthotels.com. With 225 acres of lush countryside, Meon Valley, A Marriott Hotel & Country Club is one of the most scenic properties in the United Kingdom, and its renovated event facilities provide the perfect way to enjoy them. Intimate gatherings and large functions alike will discover that the dedicated services of event coordinators make planning each detail a breeze. Guests, meanwhile, can take advantage of the surrounding beauty by playing the 18-hole championship golf course or jogging along the fitness trail, while the fitness centre, heated indoor pool and tennis court provide other options for staying active. When it's time to rest and recharge, the hotel offers two restaurants, Zest (a casual eatery) and Broadstreet Restaurant (an award-winning destination), to satisfy every craving. The 87 guestrooms and 26 suites offer refreshing views of the greenery outside while their plush bedding invites guests to simply sit back and relax. Meon Valley, A Marriott Hotel & Country Club is offering an all-inclusive wedding package during 2014. This romantic property is handling every detail to make each wedding a memorable affair.